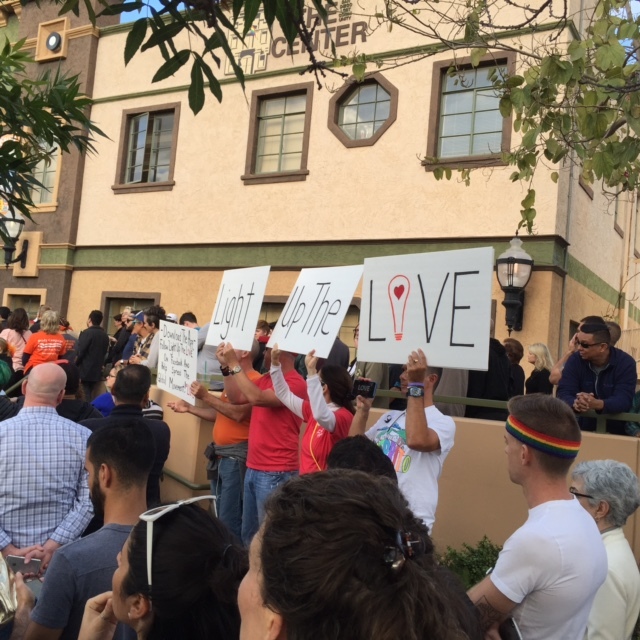 “I was comforted to be a part of a very loving and emotionally moving evening this past Monday at the San Diego LGBT Community Center Light Up The LOVE Vigil. A wonderful group of LUTL Ambassadors joined thousands of other San Diegans in the heart of Hillcrest to remember and honor the victims of the mass shooting in Orlando, FL. A special thank you to the San Diego LGBT Community Center for hosting this special event. Another special thank you to the SD Police Department for all their dedication to protect and support all of the diverse communities in our beautiful city. This entry was posted in The Movement. Bookmark the permalink.